For a baby birthday party, you will probably want to make it cute. Yes, everything related to the newcomer is sweet and cute. 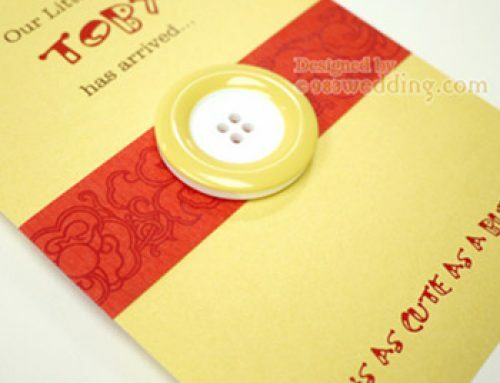 To this end, it will also be a good idea to make the party invitation cute and sweet. This cute birthday invitation is specially designed for your beloved baby. This two simple and cute designs are created for the baby shower or birthday party. 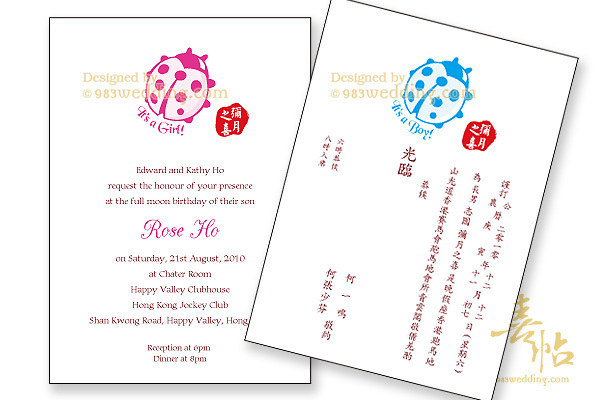 A cute little beetle is drawn and printed on the card as the main graphical interest of the invitation. In fact, we have attempted to make this design simple. 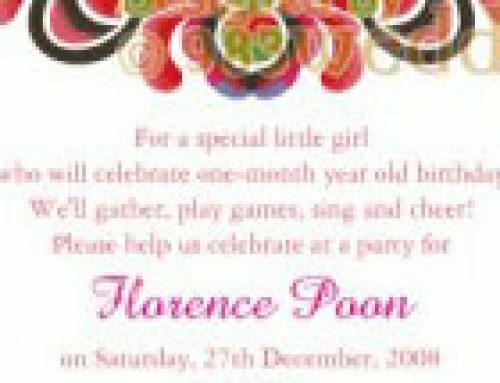 It is true that a baby birthday party invitation can be very colorful and fancy. Yet, we do not do this in this design. Instead, we make it simple so as to create options other than the ones which are fancy. When considering the colors of the print, we use light blue for a baby boy and pink for a baby girl. The choice of these two colors is quite self-explained. However, this is not something fixed. Who says blue color does not fit the birthday party of a babe girl? You can always discuss with us on all these design details. Traditionally, Chinese people will celebrate the 1-month or 100-day birthday of a baby. We have also addressed this idea in this invitation design. Four Chinese characters “彌月之喜” (literally means happiness of having been given birth for a month) is printed as a traditional Chinese chop on the card. This is to tell the guests that it is the 1-month birthday of the baby. These four characters can be changed to “百日之喜” (literally means happiness of having been given birth for a 100 days) if it is the 100-day birthday party of the baby. For a baby shower party, the Chinese stamp print can be removed. In fact, one of the concepts of putting this stamp is to add a Chinese touch to the card. If such a touch is not needed, it will be a good idea to remove this stamp no matter it is a baby shower or a birthday party. To make the look of the design clean, the color of the card is white. And it is a single card. Meaning that you will print one language of wording on one side. Two languages can be printed in maximum.